This month, over 8 million fast food and low-wage workers like me got a raise in California and New York. As someone who has skipped meals and rented shared rooms because of financial hardship, winning a $15-per-hour minimum wage was a huge victory for me, and one they told us was impossible only a few years ago. Fortunately, with Bay Area cities passing increased hourly salaries, and the Fight for $15 campaign spreading across the country, minimum wages have started to improve. Yet laws about work hours haven’t kept up. For 16 years, I’ve worked hard as a cook in many fast food restaurants—KFC, Carl’s Jr., McDonald’s—so I’ve learned how to scramble for enough hours. I have to constantly ask my managers for more shifts, which rarely come through, so instead I’ve had to piece together two or even three part-time jobs just to get enough hours of work to pay the bills. I’ve been lucky that all three jobs kept stable schedules, but my co-workers couldn’t say the same. With constantly changing schedules, they couldn’t find a second or third job. The problem is, even as we’ve fought for and won better wages, companies like McDonald’s keep manipulating our schedules and cutting our hours. All too often, instead of creating full-time jobs, companies hire more and more part-time employees. At some jobs, I’ve gotten 25, or 28 hours a week. Some of my friends are only getting four or eight hours of work a week. Even with a $15 minimum wage, no one can get by with so few hours. That’s why in February our community took a first step toward ending these scheduling abuses. 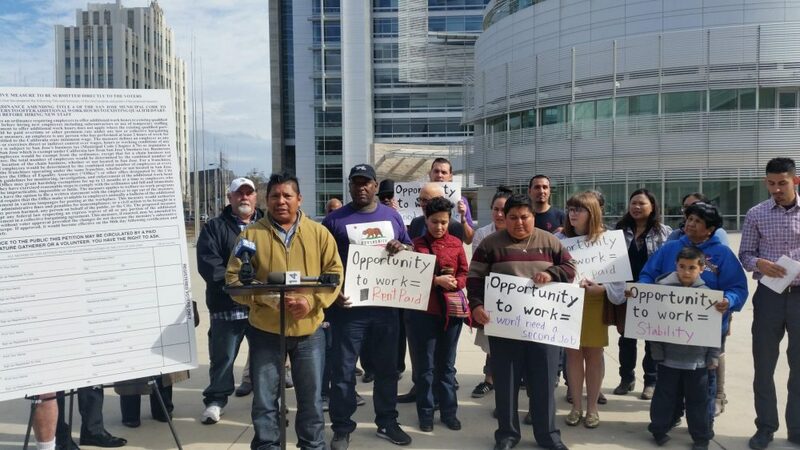 I stood in front of City Hall in San Jose, California, with other fast food workers, clergy members and leaders from small businesses, labor unions, and the community to propose a change: updating the workplace hours laws so part-time workers have the chance to work enough to cover their bills and put food on the table. The Opportunity to Work Initiative—the first of its kind—would require companies to offer additional work hours to current qualified part-time workers before hiring new staff. The proposal would apply to businesses that have more than 35 employees. (Chain stores and restaurants would be included if they have more than 35 employees in all locations.) We gathered 18,800 signatures to put this ordinance on the November ballot in San Jose, the nation’s tenth largest city. The initiative was launched under Silicon Valley Rising, a campaign that works to build an inclusive middle class in this region where so much poverty exists alongside world-famous wealth. We’re joining with the national movement of hourly workers demanding a fair workweek with common sense updates to our workplace-hours policies. Our hard work helped McDonald’s make $4.5 billion in profits last year alone. They can afford to pay us a decent wage and give us the opportunity to work enough hours to support our families. Yet, to keep costs as low as possible, they often hire new people for shifts that could have been filled by my co-workers and me. McDonald’s isn’t the only company manipulating schedules and shortchanging those of us who work hard to make their companies a success. It’s been the same at every place I have worked, and it’s the same where my friends work. I’ve seen a lot of people quit because they can’t afford to keep jobs with so few hours and schedules that change all the time, but the companies do it so they have a pool of people who can be plugged into last-minute schedules, and who are not earning benefits. Nationally, people working part time are typically paid a third less per hour than full-time employees. Seventy-seven percent of part-time workers in San Jose make less than $15 per hour, according to the U.S. Bureau of Labor Statistics. That’s why I believe the Opportunity to Work Initiative is so important. As a part-time worker, I’ve never had health insurance, a retirement plan, or sick days until California passed a sick leave law a couple of years ago. Before the law passed, I would go to work when I was sick. I couldn’t afford to lose the money from my paycheck because my family, who live in Mexico, was counting on the funds I sent home every month. I will do anything so that my children can get an education, good jobs, and not go through what I have. Juggling three jobs and supporting three kids meant I’ve had to plan everything in my life down to the penny. With average Silicon Valley apartment rents topping $3,000, I share one room in an apartment where six people live. When I first moved in I had to put down a $500 deposit for my half of the room, so I cut back to eating one meal a day. I would pay my rent and cell phone bill on the first of every month, and then try to get through the rest of the month spending as little as possible. And because I was paid by the hour, I also had to plan down to the minute. On Mondays, my shift at KFC began at 8 a.m. and ended at 4 p.m., the same time I started work at the Carl’s Jr. across the street. My hours at that job ended at 9 p.m., the same time I started a four-hour shift at a nearby McDonald’s. The other six days of the week were a little easier: I worked 8 a.m. to 4 p.m. at KFC, and 6 p.m. to 1 a.m. at McDonald’s. Given the schedules of my three jobs, I would sleep about three or four hours on Monday nights and a little more the other days of the week, although sometimes the stress left me tossing and turning. On Mondays, I had no time to eat between jobs, but I was sleeping so little that I wasn’t really hungry anyway. My weight dropped. I am not alone. San Jose, like many other cities, is suffering from an underemployment crisis. The part-time workforce has mushroomed, growing in the last 10 years from 26 percent to 43 percent of all workers, according to the U.S. Bureau of Labor Statistics. The part-time workforce is disproportionately made up of women—63 percent—and people of color (69 percent). The bureau also reports that the number of workers stuck in part-time jobs who want full-time work has shot up 33 percent since the recession. For those of us facing this struggle, it is as though the recession never ended. My situation got worse when I injured my hand so badly that I couldn’t keep all my jobs. All my clockwork planning fell apart. I had no cushion and nowhere to turn for money—my friends were all in the same situation, barely making ends meet—so I took out a payday loan for $1,800 to make it through the month. With the interest, I will have to pay back $2,550—while still working part time at McDonald’s. If I had the opportunity to work full time at McDonald’s, I would get health insurance and go to the doctor to find out what’s wrong with my hand, which I can still barely use five months after the accident. More work hours at fewer jobs would mean more sleep every night. With the extra money, I would start an emergency fund. I can’t afford another high-cost loan. And at 52, I have to start thinking about what will happen when I can’t work anymore. Before I connected to other fast food employees with the Fight for $15 campaign, I was scared to speak out at work. Having your hours cut for no good reason, waiting and hoping for weeks to get them back, and watching your co-workers go through the same thing, you feel like you’re screaming and no one can hear you. Looking at what we’ve accomplished with the minimum wage, I see how much strength working people have when we come together and stand up for what’s right. Now we have to do the same to demand reform for the other side of wage laws—workplace hours. By setting basic standards like the Opportunity to Work Initiative for every job, with decent pay and hours we can count on, we can make hard work translate into fair pay and the ability to support our families. Pablo Nervaez has worked as a cook in fast food restaurants for 16 years and is a father of three. If this is the future of the workforce, or a lot of it anyway, it should require a much improved social safety net over the one we have now. The debt that drives the finance industry and dominates the economy assumes that everyone can pay fixed amounts all the time.